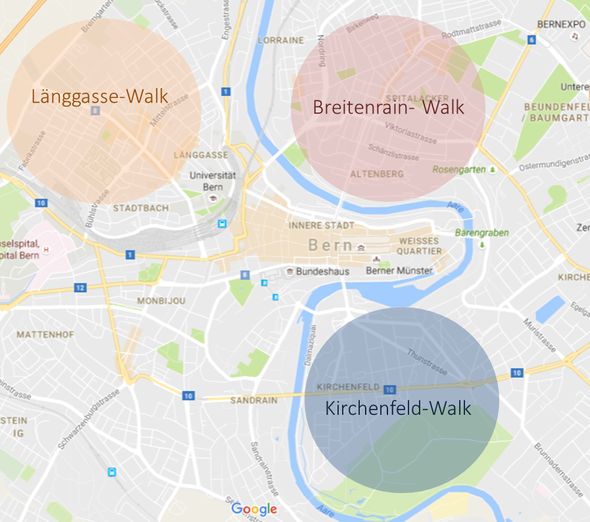 Self-Guided Walking Tours - freewalkingtoursberns Webseite! Clocktower, rose garden, House of Parliament, Einstein House… You all know the main sights of the old city centre of Bern. But did you know that less than 5% of the population of Bern actually lives in the old centre? If you want to have an impression of how normal daily live in Bern really is you have to go outside the centre. That’s why we offer those Self-Guided Walking Tours, which lead you through some of those quarters. The north-district of Bern, the Breitenrain, is characterised by small shops and cafés, as well as beautiful houses and it’s proximity to the BERNEXPO area and the stadium of Bern (Stade de Suisse), where big sport events and concerts take place. This walk guides you through this district. It shows where you can have a drink or enjoy a good ice-cream in summer, where you can warm-up in winter and it takes you through some of the nicest streets in the quarter. Additionally there are some optional walks to the rose garden and down to the river Aare, which can be combined with this walk. With this walk you discover the Kirchenfeld district of Bern. It offers a great mix between nature and city because you’ll pass some of Bern’s museums (e.g. Einstein Museum), many beautiful old houses, the zoo of Bern and you’ll discover one of the forests of the city. The walk finishes with a long and nice promenade along the river. It's a great walk for summer time! This walk leads you through the university-quarter of Bern. It covers some of the university buildings, the most popular street to hang around and have a drink after work or uni and of course some beautiful streets of the residential area of the quarter. If you've done a tour, feel free to write a review on tripadvisor! We are part of the Free Walk Switzerland network. Check out the other tours in Zurich, Lucerne, Basel, Lugano, Fribourg and Interlaken!